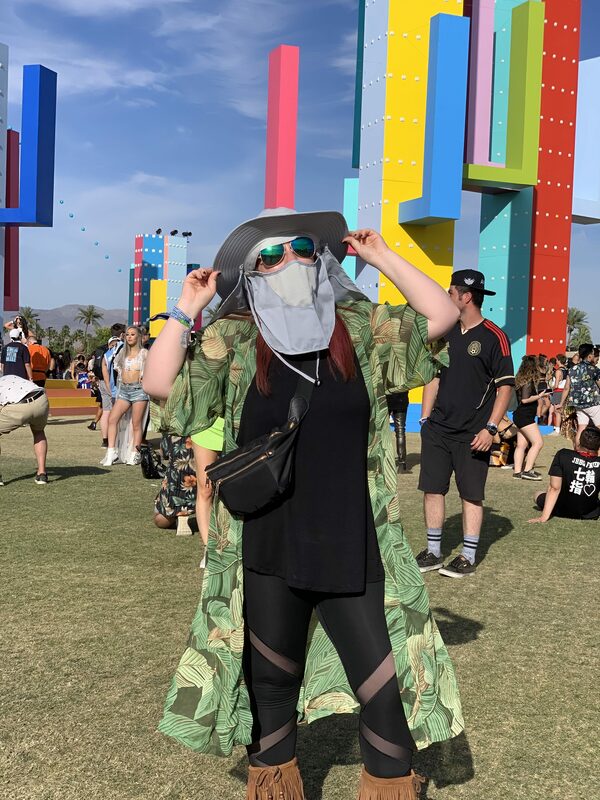 As the excitement of Coachella 2019 Weekend 1 winds down, thousands of music fans and festival-goers are returning home with sunburns, sore feet, and a ton of amazing memories. With headlining acts from Childish Gambino, Tame Impala, and Ariana Grande—plus an incredible roster of other musical performers and bands—it’s safe to say the first weekend was a success, no matter which sets you chose to attend. And since this was my eighth time attending Coachella, I thought I knew every single hack to make the festival as successful as possible. Practice makes perfect, right? But as I learned over this past weekend, you can’t plan for everything. That’s why the new Amazon Lockers, located inside the festival grounds, were a game-changer for this year’s festival, and it’s something that people going to Weekend 2 in a few days can still take advantage of. Amazon introduced its Coachella Lockers feature this year for the first time. 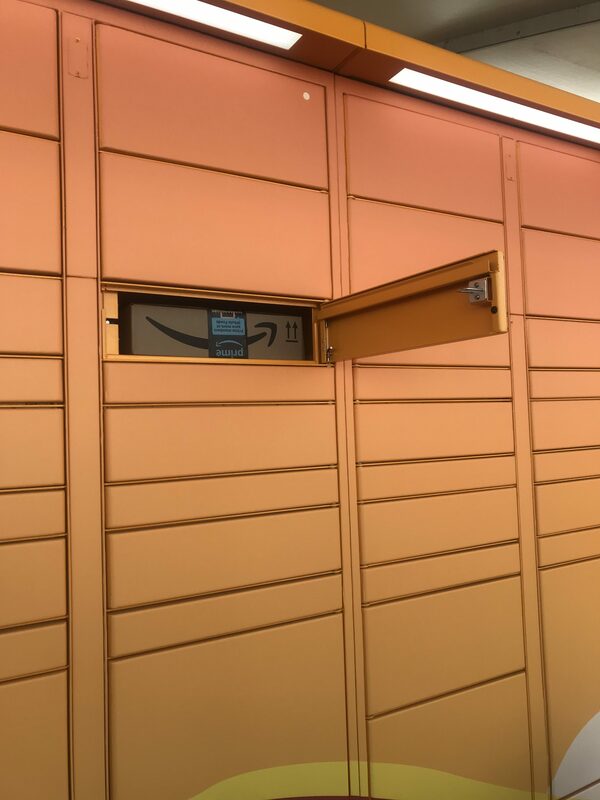 They work exactly they same way as Amazon Lockers out in the real, non-Coachella world: you order something, then choose an Amazon Locker destination to pick up your package instead of having it delivered to an address. 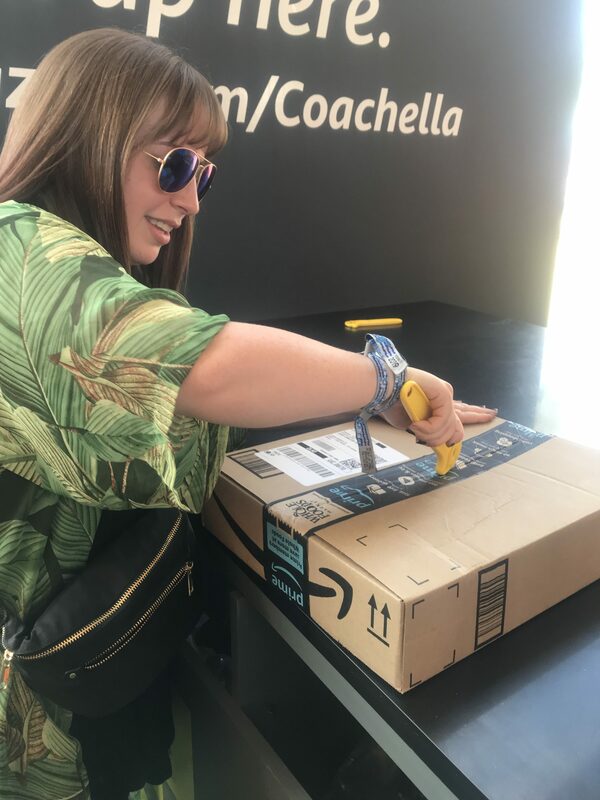 Using the Amazon app, you can ship items from Amazon’s curated Coachella storefront directly to an Amazon Locker inside the festival during both weekends of Coachella; your items will arrive in about one day, so you could definitely order a forgotten item once you’re already on the festival grounds. There are clothes, wellness products, camping gear, and other festival essentials available. However, a lot of items you might normally buy on Amazon are not available with this service as there is a pretty big list of things you can’t have inside the festival grounds, such as aerosol sunscreen, so it’s important to make sure the item you want is listed in the Coachella-approved storefront. 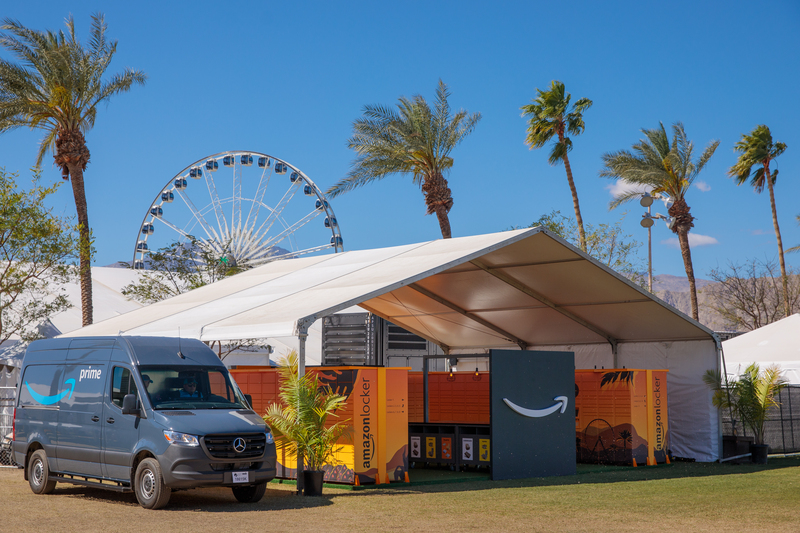 At the festival, the lockers are located right by the main stage with Amazon employees at the ready to assist with opening your locker, getting your package, opening the box, and getting rid of the garbage (with recycling for the cardboard and paper). When an Amazon representative invited me to try out the service while I was at Coachella, I thought it would be a fun experiment to see how well my friends knew both me and the festival, and asked them order me three items to use while I was there. Now, when I go to Coachella, I rough it with a big group of my friends and camp on the festival grounds instead of getting a hotel room or renting an Airbnb nearby. It’s taken a lot of years to figure out how best to prepare for camping for four days in the Southern California desert in April—temperatures can range from the high 90s during the day (sometimes hitting over 100 degrees!) to lows of mid-50s at night. Powerful wind and dust storms are a frequent occurrence, so you really have to pack for every kind of weather that might hit. Plus, you need to have all your camping gear, food supplies, toiletries, and beauty products with you, since you don’t ever leave the Coachella grounds from when you arrive on Thursday until you pack up and leave Monday morning. You really have to think ahead and prepare for whatever might come your way. With seven Coachellas already under my belt, I thought I had the perfect packing system going into this year’s festival. It had never failed me before! But the biggest lesson I learned this weekend is that you just can’t predict everything. The comfortable, supportive-yet-still-stylish shoes I always wear for 12-hour days of dancing and walking upwards of 12 miles? They rebelled against me for the first time, and I found myself with some pretty painful blisters from all the dancing and walking after just two days with a full third day still to go. So when I had previously asked my friends to order me three items from Amazon, thankfully they thought of something that had slipped my mind while packing, the most essential Coachella survival item to help me make it through the festival: Band-Aids. My camp—lovingly named Pizza Party thanks to a hilarious gas station pizza snack situation one year when we were about to drive into the festival extremely early in the morning (aka not the best time for pizza, especially from a gas station)—went ahead and used the Amazon Lockers to order me a box of Band-Aids for my feet as well as two other items that became essential to my survival. Since the campgrounds can get a little rowdy late at night (sometimes going into the early morning hours), a good night’s sleep can be hard to come by. Noisy neighboring campsites playing music is not an ideal sleeping situation. That’s why I was so touched that my friends chose to order a giant bottle of melatonin pills to help make sleeping at night a little easier. If you don’t get a good enough night’s rest, the next day of the festival will be miserable. Take it from someone who has tried to rally on just a couple hours of sleep for another 12 hours of walking and dancing—the more sleep you can get, the better. That melatonin was a godsend! If you’ve never camped at Coachella (or any other music festival), you don’t know the seventh circle of hell that comes from trying to sleep in a tent past 8 o’clock in the morning. When the sun starts to rise, the temperature of the tent rockets from a comfortable mid-60s/low-70s to the inside of an oven pretty rapidly. If you stay inside a tent past 8, you’re officially getting cooked. And trying to sleep outside of a tent when everyone else in the campgrounds is already awake, playing music, and generally having a good, loud time? That’s when that melatonin came in handy. Resting outside and still being able to sleep a couple more hours was life-changing. But it’s the third item that had me cracking up while simultaneously thanking my friends. To round out the order, they bought me a pastel blue sun hat with a face cover. Now don’t get me wrong, this was actually pretty useful, as the hat protected my scalp from getting sunburnt where my hair parted, and the face cover prevented any more dust from getting into my already-sore throat. But I’ve got to be honest, this is definitely not the style I would have chosen for myself. That light blue did not match my outfit at all! But sometimes, your friends know you better than you know yourself, and by trusting their judgement, my entire Coachella experience was saved. There was an unexpected perk as well: Since I (and my friend who picked up the package with me) were one of the first 100 people to use the new Amazon Lockers, we ended up getting two free tickets to the Ferris Wheel. And everyone knows you haven’t gone to Coachella if you haven’t taken a ride (and a bunch of photos) on the Ferris Wheel. Even though I thought I had packing for Coachella down pat, it turns out that even a festival veteran like myself needs help from time to time. 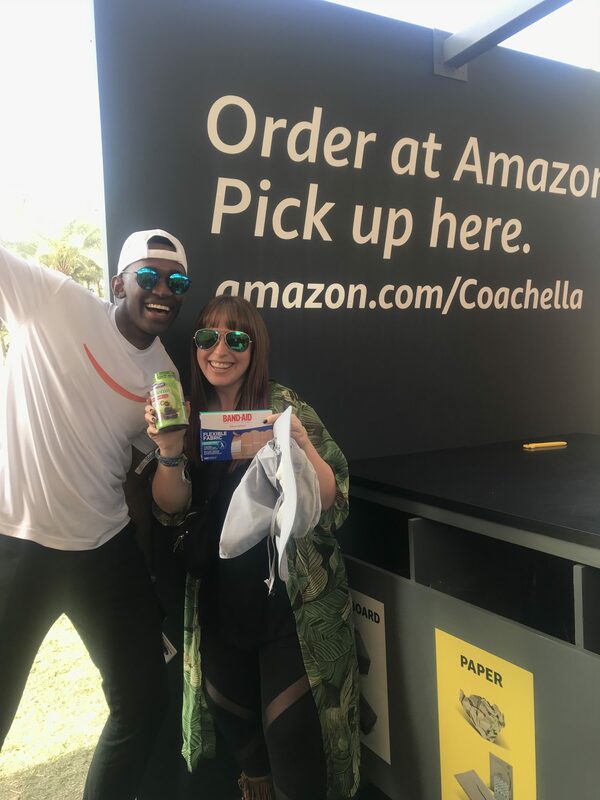 And I’m not the only one: according to an Amazon spokesperson, the most popular items customers ordered during Weekend 1 were portable phone chargers, ear plugs, sunscreen, Listerine tabs, hair ties, and lip balm. Even a Coachella pro like Vanessa Hudgens needed to use the Amazon Lockers to have a straw hat, ear plugs, portable phone charger, moisturizer, and Pedialyte shipped to her on the grounds. All of this served as a great reminder that no matter how much you prepare, something can always happen to ruin your plans. And hey, having a group of friends looking out for your best interests doesn’t hurt either.